Easter brunch is charming. It’s a cozy meal that has merged into recent wedding trends, and I don’t hate it. Typically a Saturday or Sunday* morning affair that comes to a close early-to-mid afternoon offers brides-to-be an intimate, affordable unique event that adds additional venue, menu and price options. The glory of an early morning, sunrise ceremony and brunch reception is that there are so many opportunities to be memorable. You can capitalize on the season your hosting your event. Consider the time of year and include elements that pinpoint every sense. A tented spring soiree, surrounded by pastel florals and enchanting gardens; a cozy brunch during the winter months by a blissful fire, with flannel printed linens – watching snow lay on evergreens or a cool fall morning with endless candle light and apple cider. For some ‘brunch’ and ‘formal affair’ aren’t compatible, but they totally are! Don’t be close-minded or let others question you! You don’t have to lose out on your princess dreams because you aren’t having a traditional, rock-star night event. Think Upper East Side: fine china, 3-course meal and dress to kill. You can truly dress as up-or-down as you’d like. Want a formal affair? Opt for a traditional wedding gown and black suit or tux for your groom. Want something a more low-key? Try a tea length or short bridal dress. Have your groom in a casual navy or gray suit (tie or no tie) or even jacketless. Dress the bridal party and parents as formal or casual as you intend your event to be. They will also help set the tone. You know yourselves and guest best. Think about ‘how early is too early?’ I’ve seen a wedding at 6AM with a 250-guest turn out and a smaller affair at 8AM with 36 guests. Sunrise isn’t out of the question by any means. It’s your day! Your menu can be buffet, plated or even modern-fun stations; such as an omelet station and crepe station. When preparing your brunch menu think of your cocktail hour and reception separately in menu terms, as you would a traditional evening wedding. Some guests won’t be ready to dive into french toast and poached salmon right away, and may opt for a light starter like a fruit salad or yogurt and oat parfait – or my favorite a traditional cinnamon bun with a little orange zest flair. 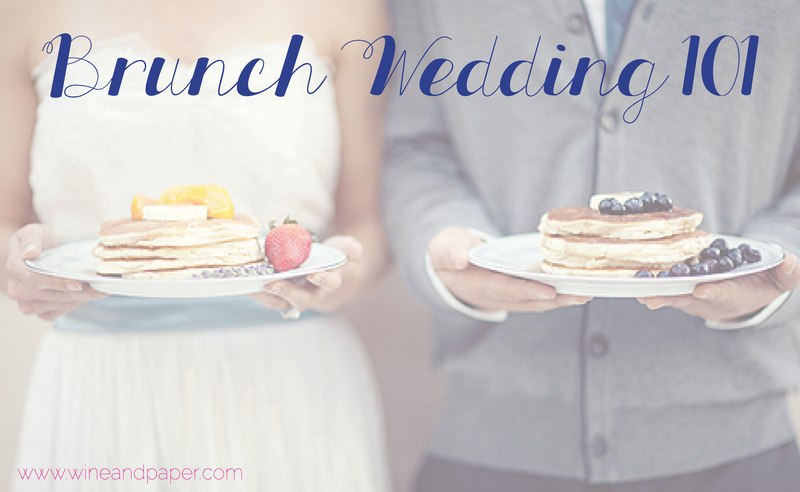 There truly are a million options and this post could be several pages just regarding the menu, simply because brunch weddings have a heavy focus on food – but to shorten it up… my advice: think trendy, traditional, gourmet. You can absolutely opt for traditional cake; although, you may want something light and airy flavor like lemon, carrot or vanilla verse a heavy fudge cake. You can continue non-traditionally with pies, cookies, chocolate covered fruit or a naked cake. Most morning weddings have a much lower bar bill, simply because people don’t drink as heavily in the morning. If a dry wedding isn’t mandatory and you are “teeter tawing” between bar and no bar, I definitely say bar! You most likely won’t need a full-bar or even wine and beer options. If you keep the mimosas, bellinis, bloody marys, mint juleps and spiked coffee flowing, everyone will rise to the early morning occasion. Don’t forget your non-alcoholic friends: Fresh juices, coffees, espresso bar, smoothies, sweet tea, and lemonade – even a swarm of various flavored hot teas or creamers can be added for fun. Due to the time and nature of the event, morning weddings typically don’t have large centerpieces, up lighting and a crazy DJ. They’re often more intimate and a time and place for everyone to gather, talk and celebrate in a calmer fashion. My favorite morning wedding entertainment is a string quartet from beginning to end. To jazz it up a bit, literally, a New Orleans jazz band isn’t reserved for evening events and may even get your guests out on the dance floor (win-win). For additional non-dancing, surprise entertainment, go Pitch Perfect style and hire an a capella group to serenate your guests. Really wanted to have a sunrise ceremony and brunch reception, but want to keep the party going? While you typically wouldn’t invite all the guests, this is a great chance for you to continue the celebrations with those closest to you with a local bar hop, night out on the town, private sunset cruise or even and afternoon out on the green. While a morning wedding isn’t for every bride, it’s a dynamic and appealing option to be different – especially with a smaller budget, and there are clear advantages. Timelines of weddings are changing, which is proving to be a good thing. If all else fails, a glass of red & to-do list should get you through. *If having a Sunday morning wedding, be aware that a church venue may not be accessible due to scheduled services and you may want to end your event earlier in the afternoon, as many guests will return to work Monday morning. While reading through morning wedding successes, concerns and questions – I came across an extern from Wisconsin Brides from bride Wendy, and couldn’t help but to fall in love with the planning and logistics of their day. 40-minutes may seem like a harsh request in a traditional wedding timeline, but when given coffee, cider and doughnuts – and encourage to take the scenic route – YES, PLEASE! On a crisp, late-October Saturday morning at 10 o’clock, 200 guests gathered at Blackhawk Church for the ceremony. Afterward, they were treated to doughnuts, hot apple cider and fresh coffee for the scenic drive out to Wintergreen Lodge at the House on the Rock Resort, about 40 minutes away in Spring Green. Guests were encouraged to stop along the way to soak in the breathtaking fall color and enjoy their coffee while the bridal party took photos. Upon arrival, cocktails and a signature mimosa drink were served, then a full brunch buffet began, featuring quiche, pastries, fruit and a roast beef carving station. I opted for a traditional wedding cake, but chose two brunch-themed flavors, orange and cinnamon roll. After dining, a full dance ensued with a live bluegrass band, featuring rock, country and swing. The music fit with the daytime vibe. We saved enough per plate to allow them to invite more guests and include more loved ones, and the daytime hour afforded gorgeous country views that would have been obscured at night. Many family and friends who had traveled from a few hours away didn’t need to book a hotel room.